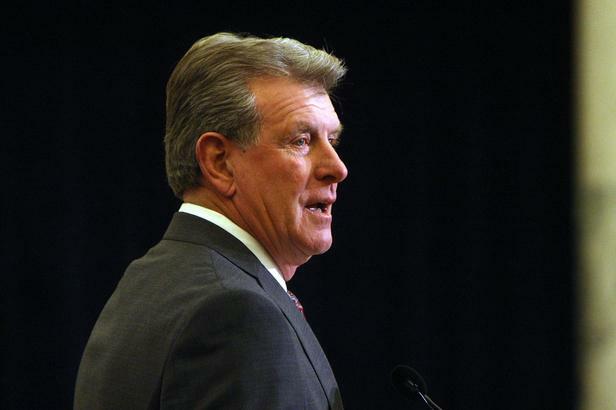 Idaho's eight college and university presidents opposed the legislation. Boise State University's president Bob Kustra is among them. The bill will allow concealed carry permit holders to have their firearms on campus, except in dorms or venues with more than 1,000 people. A Boise State spokesman declined to comment. The Idaho House has voted to back a bill allowing students, faculty and visitors carry guns on college campuses. The bill passed with a 50-19 vote, with proponents arguing it upholds Second Amendment rights and allows people on campuses to protect themselves. But lawmakers who voted against it skewered the measure, saying it's being pushed through despite opposition from leaders of all eight public colleges and universities. Those leaders worry it will disrupt learning environments and put people at risk. Idaho Republican Gov. C.L. "Butch" Otter is officially running for a third term. Otter filed his declaration of candidacy Monday with the Secretary of State's Office. In a statement, Otter says he wants to continue to make Idaho the best place in America to live, work and raise a family. The former congressman has been widely expected to seek re-election. Gov. C.L. "Butch" Otter signed a bill threatening people who secretly film animal abuse at Idaho's agricultural facilities with jail and fines. Otter inked the new law Friday, two days after it cleared its final hurdle in the House. Otter, a rancher, said the measure promoted by the dairy industry "is about agriculture producers being secure in their property and their livelihood." More than 200 people against a bill that would allow permit holders to carry concealed weapons on Idaho's university campuses protested Thursday in the rain outside the Statehouse. The group was made up primarily of students and faculty of Boise State University and the College of Western Idaho.